Few realize what the current global arms buildup is costing! TODAY, many small and poor nations pay vast sums to have access to modern military miracles. The result? A conventional arms race as dangerous, if not more so, than the nuclear arms race between the United States and the Soviet Union. Yet there is a paradox in all of this. 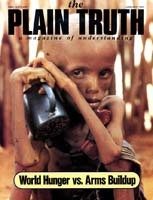 While nations spend enormous sums on weapons, millions of human beings are malnourished or starving. Agricultural time bombs continue to tick away, periodically exploding in isolated, but devastating droughts and famines. What's behind this global conventional arms buildup? What is it costing the poor? More important, where is it leading us all? In 1945, an exhausted world finally began sifting through the rubble and ash of the most frightening global conflict humanity had ever witnessed. Hopes for peace, lasting peace, seemed, to the world's diplomats, possible at last. But while millions were heaving a collective sigh of relief at the cessation of hostilities, the foundation had already been laid for future conflicts and turmoil. The Plain Truth was even then warning: "The way of peace they do not know..." (Isa. 59:8 NIV). The United Nations, like its predecessor, the League of Nations, proved to be impotent at preventing local wars between nations. It had no power to change men's hearts. The Cold War between the U.S. and the U.S.S.R. rapidly progressed from the 1940s to the 1960s. The United States saw communism as a force that threatened to undo society — Western civilization itself. As Soviet military power grew and assumed a more determined posture, the U.S. tried to contain it. Under the Truman Doctrine, the United States acted to ring in the Soviet Union by arming nations friendly to the West. Communist insurgency, it was hoped, would be stopped. The Soviets, meanwhile, saw a different picture. World War II had made a definite impression on the Russian mind. One in 10 Soviet citizens lay dead. Having been invaded four times in 150 years from the West, the historic-minded Soviets determined to make sure that the Russian people never again suffered the horrors of war on their own soil. The Soviets responded to the U.S. encirclement tactic by sponsoring "wars of liberation" to secure new allies of their own outside the U.S. ring of steel. The real and perceived threats presented by American and Soviet actions and reactions radically altered usual post-war scenarios. Instead of reducing manpower and spending levels to "normal" peacetime levels, neither the United States nor the U.S.S.R. felt they could afford to do so. Mistrust was too strong. In his book Preparing For the Next War Michael Sherry points out that U.S. peacetime military manpower increased from an average 275,000 men in pre-war years to more than two million men after the war. Peacetime spending soared from pre-war levels of no more than $650 million a year to more than $80 billion (thousand million) by the early '70s. It reached a staggering $120 billion in 1979. Neither the United States nor the Soviet Union wanted a direct confrontation. Both sides, therefore, began a kind of war by proxy, winning allies, extending influence and keeping up pressure on each other by means of arms sales. By the late 1960s, arms sales had become an integral part of the foreign policies of both sides. From 1960 to 1980, worldwide military outlays grew from $100 billion to more than $500 billion a year. That last figure is twice the 1981 gross national products of Mexico, the entirety of Central America and all of the various Caribbean nations combined. Nations are indeed often motivated by fear of outside aggression. For a number of nations, spending levels reflect the need to maintain a high level of military visibility to keep the local population in line. And for many, the prestige of having expensive sabers to rattle is enough reason to maintain a military establishment. Diplomats have expressed concern about the sale of these weapons. But very little has been done to abate the flow of arms to even the most volatile areas. Arms sales are big business. From 1975 to 1979, the five leading arms exporters — the United States, the Soviet Union, France, the United Kingdom and West Germany — exported $66.7 billion (constant '78) worth of arms to clients around the world. From 1950 to 1979, the United States transferred $110 billion worth of arms and related services to other nations. That was more than half the world's total. However; by the late '70s and early '80s, with the U.S. restricting its arms sales, the Soviet Union overtook the United States to become the biggest arms merchant. From 1972 to 1981, the Soviets delivered 74,000 major weapons systems to its clients while the U.S. delivered 44,000 systems. Soviet deliveries included 23,250 surface-to-air missile systems, 3,705 supersonic aircraft and 13,220 self-propelled guns and tanks. U.S. deliveries included 8,890 surface-to-air missile systems, 1,540 supersonic aircraft and 7,440 self-propelled guns and tanks. Even with all of this equipment being sold, there was, nevertheless, room for other producers to sell their wares. Under the guiding hand of the Delegation Generale pour I'Armement (DGA), which oversees sales and production nationwide, France has become the world's third largest arms salesman. From 1970 to 1980, French arms sales increased fivefold. This surge in French arms sales has been in part because of France's need to' maintain a viable, independent arms industry. Sweden has come to face this problem, but in a different way. The Swedes are considering purchasing from foreign sources rather than increasing exports just to maintain arms industry independence. An aggressive sales policy has given France a bad reputation. Andrew J. Pierre, author of The Global Politics of Arms Sales. puts it this way: "Its [France's] arms sales policy generally has been considered to be the most permissive of the major suppliers, with the assumption often made that the French government is willing to sell almost any weapon to anybody" (page 83). Britain, on the other hand, has declined from the number two spot during the 1940s and 1950s, to number four. The United Kingdom now exports only 25 to 30 percent of its production. West Germany has tended to practice restraint in arms sales. But the government has come under increasing political and economic pressure to expand arms sales to create jobs. Who Are the Arms Buyers? Every year, officials from nations around the world go arms shopping. In their quest for weapons, they peruse the arms bazaars, such as the Paris Air Show or the British Army Equipment Exhibition, to pick up the latest fighter aircraft or battle tank. A quick analysis of arms sales shows that money is becoming a more crucial concern for sellers than ideology. For instance, Libya recently requested postponement of payments on its large arms bill. To which the Soviets, in need of hard currency, replied "Nyet"! An economically struggling Latin America, Africa, and Oceania are not the big buyers. The bulk of arms spending and arms imports centers in the Middle East. Editor-in-chief Herbert W. Armstrong has long told readers of The Plain Truth to watch events in the Middle East. Bible prophecies point out this volatile region as the focus of the next cataclysmic world war. Saudi Arabia, with a population of less than 10 million, ranked sixth in annual military expenditures in 1980. Libya, by 1981, possessed an air force of 210 aircraft. However, Libya has to "import" Syrian, Pakistani, North Korean and Palestinian pilots to fly its aircraft — two-thirds of which are sitting in crates, as yet unpacked! In Israel, whose citizens bear the highest military expenditure burden in the world, the story is similar to other Mideast nations. After the perilous 1973 war, which very nearly involved the United States and the Soviet Union, Israel began a major arms rebuilding program. The effect of this buildup was demonstrated by the surprising success of Israeli tactics and their largely U.S. — made equipment against the Syrian's advanced Soviet-made SAM missiles and top-of-the-line T-72 tanks in the recent conflict in Lebanon. We are indeed living in a time foretold nearly 2,700 years ago by the Hebrew prophet Joel. A time when the nations would be preparing for war and even the weak nations would say, "I am strong" (Joel 3:9-10). In their strategy to use nuclear weapons to guard against new Hitler's, both the United States and the Soviet Union failed to understand the consequences. The presumed unthinkability of nuclear war, along with the entry of other, more aggressive, less ideologically inclined arms merchants, made scattered conventional wars both more preferable and probable. Like so many Frankenstein monsters gone out of control, these well-armed Soviet and American clients have on numerous occasions nearly brought the two superpowers to blows. Dangerous precedents in the Middle East and the South Atlantic have been set which the nations must now ponder. The eminent British historian A.J.P. Taylor puts it this way: "In the old days the deterrent [conventional arms] worked nine times out of ten. Now presumably it [nuclear arms] will work ninety-nine times out of a hundred. But if past experience is any guide... the hundredth occasion will come" (Introduction, How Wars Begin. Atheneum: New York, 1979, page 16). Lebanon, the Falklands, Chad, the Horn of Africa, Western Sahara, Namibia, El Salvador, Cambodia and Iran-Iraq all bear recent grim witness to man's failure in making peace. It is time we read the Bible's prophecy for our day: "While people are saying, 'Peace and safety,' destruction will come on them suddenly, as labor pains on a pregnant woman, and they will not escape" (I Thess. 5:3, NIV). No, humans do not know how to bring peace. What is needed is "an unseen strong hand from some place." The good news is that that unseen strong hand is coming to intervene in the affairs of men to save mankind from utter destruction. Jesus Christ is coming again to usher in an age without hunger — a new age of prosperity and peace. Men will be forced to put away the weapons of war and war strategies altogether (Isa. 2:4). Instead of appropriating money for missiles and aircraft, nations will begin to use their new-found resources to build homes, schools, new means of transportation, bridges; a whole new future. It will be an abundantly peaceful future. And the wars of the past will become a distant memory. For a preview of this new age of peace that is sure, read our free booklet The Wonderful World Tomorrow - What It Will Be Like.